Bologna forward Simone Verdi has confirmed he has accepted a move to join Carlo Ancelotti's Serie A runners-up Napoli next season. The 25-year-old turned down a move to Napoli last January but is now ready to head south where he will team up with fellow Italy international forward Lorenzo Insigne. 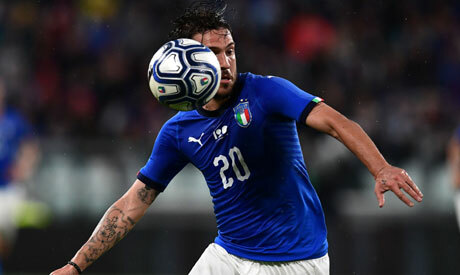 "I have always been consistent, I said in January that I wanted to end my journey and season with Bologna," Verdi said after Italy's 1-1 draw with the Netherlands in Turin on Monday. "It had nothing to do with Napoli, nor did Carlo Ancelotti have anything to do with me saying yes in this transfer session. "We spoke briefly to each other, but it was a formal conversation. I already worked with Sarri at Empoli, so I knew him well already. "I simply wanted to end the season with Bologna and show my gratitude for their support." Verdi -- who has won four caps since making his senior Italy debut last year -- missed two chances to score his first international goal on Monday night. He scored ten goals last season for Bologna who he joined after Carpi were relegated in 2016, having also previous played for Torino and his boyhood club AC Milan. Bologna finished the season just four points above the relegation zone. For more sports news and updates, follow Ahram Online Sports on Twitter at @AO_Sports and on Facebook at AhramOnlineSports.